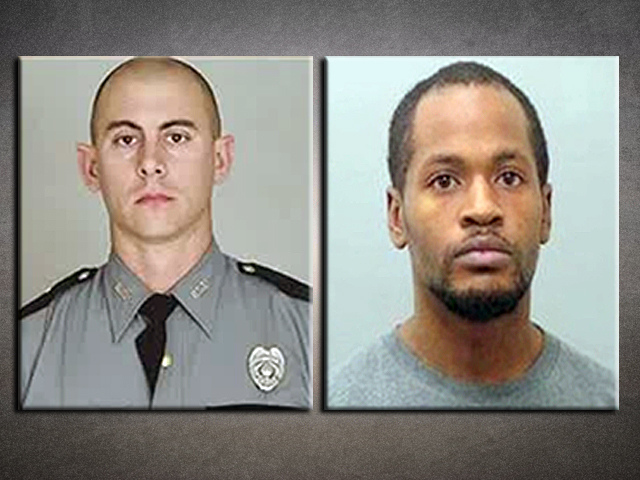 A Kentucky state trooper was killed in a shooting during a chase, and officers shot and killed the suspect when he refused to drop his weapon after an hours-long manhunt, police said Monday. Trooper Joseph Cameron Ponder, who was 31 and had been on the force less than a year, was conducting a traffic stop Sunday night around 10:20 p.m. on Interstate 24 when the driver fled, Kentucky State Police said in a news release. A chase ensued with the suspect stopping abruptly, causing the trooper's vehicle to "make contact" with the rear of the suspect's vehicle, the news release said. The driver then fired several shots into Ponder's police cruiser, hitting him several times. Ponder was taken to a hospital, where he died shortly before midnight, the release said. The suspect, 25-year-old Joseph Thomas Johnson-Shanks of Missouri, ran away and was found hours later in a rural, wooded area, said Trooper Jay Thomas, a state police spokesman. Johnson-Shanks refused to drop his weapon and was shot by officers, and he later died at a hospital, Thomas said. State police said numerous law enforcement agencies, as well as helicopters and dogs, were used to help with search efforts in the rural, wooded area that has homes scattered about. Thomas said there are numerous vacant summer homes in the area. Police closed a 9-mile section of the interstate while the search was being conducted.